"Reviewing the Economic Forecast update, Chapman College, 1986"
Reviewing the Economic Forecast update, Chapman College, Orange, California, October, 1986. Standing left to right: Professor Essmael Adibi, Ann Cameron. 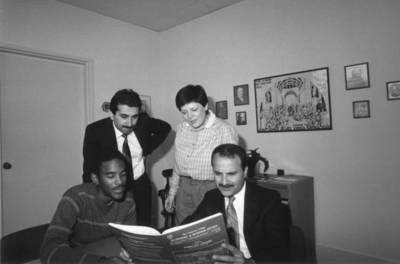 Seated left to right: unidentified student and Dr. James Doti.